The lake level is low, yet it’s still a beautiful sight. Bridget and Spike are in their suits and ready to go! We walk the paved road to the day use area, passing picnic tables and grills. Weathered rocks separate each picnic area. Instead of joining the Sunday swimmers at the beach, the crew and I walk over to the deserted boat ramp area so Spike can have a private soak. Oooh… easy does it. Spike carefully lowers himself into the water. Only one person is fishing, and he’s way over by the narrow part of the lake. This is what can be caught from Delmoe Lake: smelt, rainbow trout, bluegill, sucker, northern pike, cutthroat trout, rock bass, whitefish, sunfish, and yellow perch. 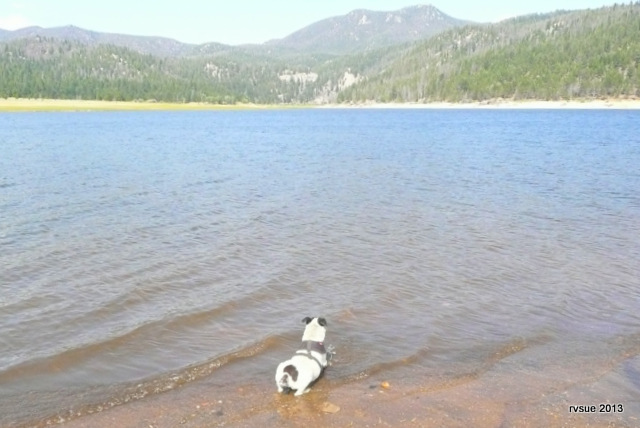 Spike takes possession of Delmoe Lake. From this side, looking across the lake, there are no signs of human activity, only a faint trace of a dirt road. 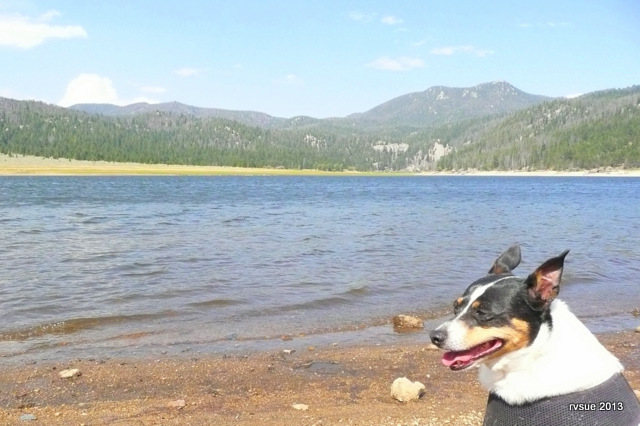 The lake is less than ten miles from Butte, yet any populace seems a world away. Okay, that was nice. Now for some exploring! We walk to the end of this side of the lake. The beach becomes rocky. 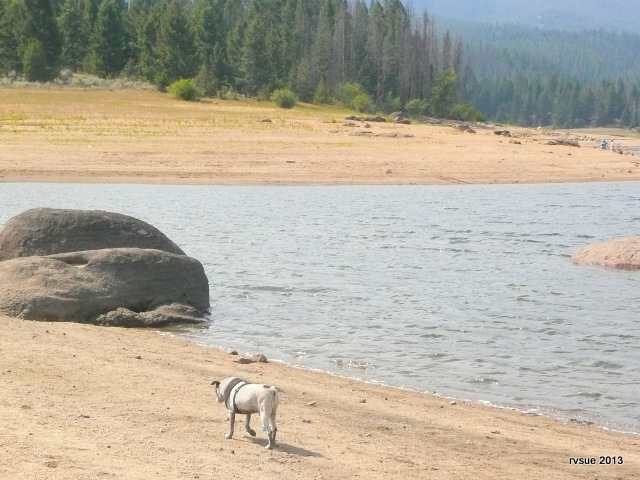 Bridget and Spike stroll the water’s edge. These two little nutcakes have a wonderful life! We wander around the big, strange rocks. Few people are here, considering it’s the weekend and children are out of school. Here’s Bridget! She’s posing for a travel brochure. We head back to our campsite for an early supper. Spike plods home. A short nap and supper will recharge him. 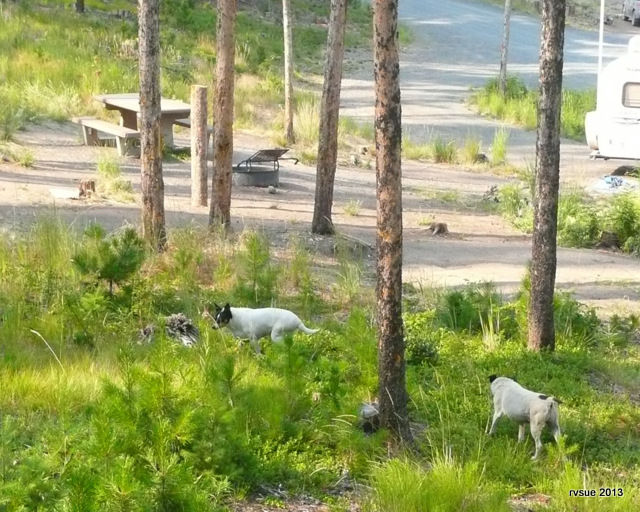 Later, after supper, the crew investigates the property around our picnic table. We won’t stray far from camp and get lost again! It’s July 29th and cool. The Best Little Trailer is pelted with rain during the night. We wake to a freshly washed forest smelling piney and pure. 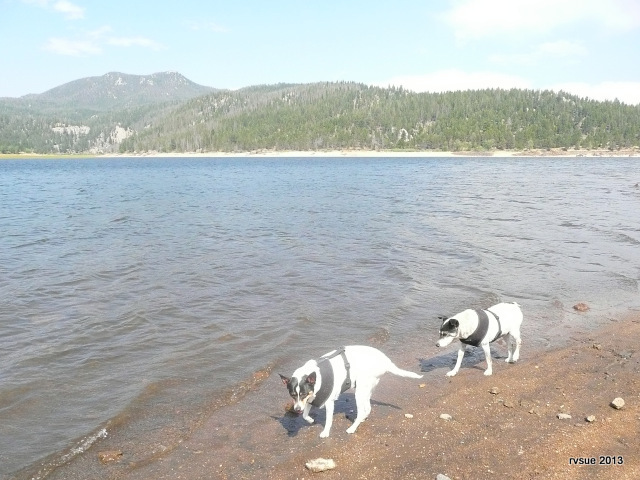 This entry was posted in Simple living and tagged Butte, camping, Delmoe Lake, fishing, Montana, nature, rat terriers. Bookmark the permalink. Great pics as usual……Gotta love soaking Spike. 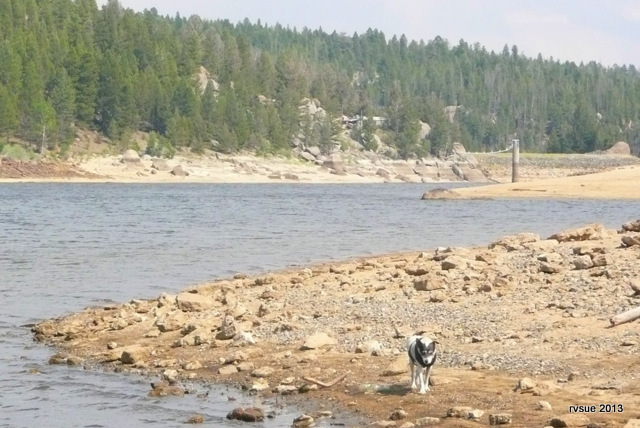 Sue Says “The lake is less than ten miles from Butte, yet any populace seems a world away.” Tell me you mean as the crow flies… Just looking at the road up to the Lake from Hwy 90 on Google Earth makes me dizzy. Brings to my mind the fellow from Texas visiting his poorer relatives in Arkansas… He says” Yep, I got a Big old spread down home in Texas… I can get in my Pickup on one side of my property and drive just about all day to reach the other side” …. Poor old Arkie says… “Yep, I had an old pickup that ran ’bout that bad once.” Great Post again Sue… Those Companions are so Funny to read about. Thanks! Ha! Cute story, Ernest. A minute ago I sat down with my morning coffee, opened up my laptop, read your comment, and laughed. Thanks for a great start for my day. Yes, it’s as the crow flies… 9.4 miles to be exact. It’s 10 miles from the interstate exit to the lake, which doesn’t seem like much, but it’s not a quick trip as you’ve seen on Google Earth! Hubby says “it’s very easy, take a wire connect it to the positive post on battery… to the fan blower on the right hand side under hood. Disconnect the one wire going to the blower and then take wire from battery positive post and touch the end to the blower motor where you unplug the blower motor wire. The blower motor should RUN then, if it runs then it is an electrical problem under the dash, most likely a switch since the fuses did do the trick. IF the blower motor does not start, then you have a bad heater/blower motor. If all else fails…. hubby with his ER tool bag will be traveling with me to Oregon. Not sure where you might be around September 20ish, but we will be headed back from the Portland area down through Bend and over to near Twin Falls, ID and then UT, WY and back to CO. If you haven’t figured it out by then, and we manage to meet on the trail… he will take a look at it. You’ll know us… I’m the blonde driving the 40′ RV towing the full-size Suburban who will creeping along about 55MPH! We’ve had rain here in Northern Colorado for the last couple of days, nice not cooking that is for sure. Have fun – you’re in a great area. I’ve never purposely disconnected a wire in my life and I don’t plan on starting now! 🙂 Really… I can play at the lake, read a book sitting in the pine forest, or stick my head under the hood of the PTV . . . um, let’s see…. what shall I choose? Give your husband my thanks for the instructions. My success rate is zero with auto mechanics, so I’m taking early retirement. Very nice offer to help… Thank you! It’s not likely we will run into each since we’re taking the high road (northern ID and MT) and you’re taking the low road (southern ID and UT). BTW, sounds like a wonderful trip ahead of you. Enjoy every mile! After a long day at work, it was so refreshing to read your blog and get a good laugh at Spike and Bridget! They are like the Keystone Cops. I am enjoying your travels. Keep on doing what your doing. Spike and Bridget give me laughs, too. I’m glad you are with us on our travels. You have a great day! Love “Spike Soaking number 1,268”. When is the photo book coming out? Sit, Soak, Spike. Good Dog. Soak. The story of Spike and Sue. I vote for Someone Spiked my Water. Thanks for the laugh Brian. Sue thank for the terrific read and photos first thing this morning. Gee, first Ernest gives me a laugh and now another one from you! Love the titles… I can’t decide which one I like the best! 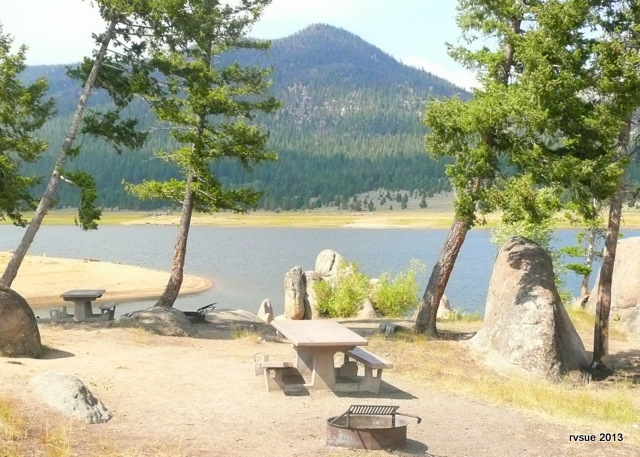 This is one of the most appealing campsites you’ve been in and you have a knack for picking out beautiful spots. I hope you’re set to stay awhile. I can’t remember if you found your propane. Is it cold at night? 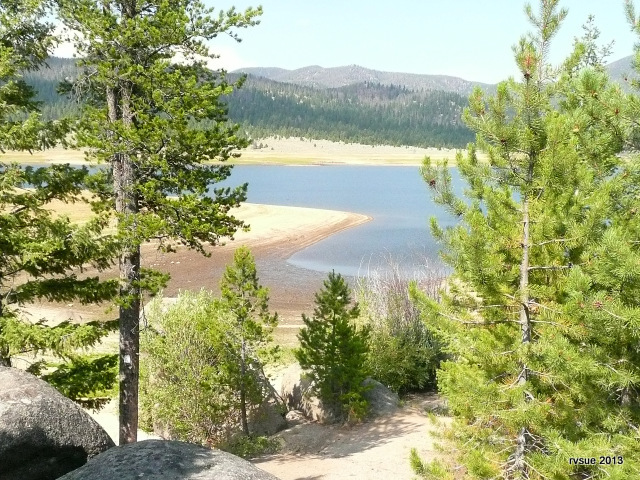 I would like to put Delmoe Lake on my list of campgrounds to visit but from what you said about the road it might impassable pulling our Montana. Another vote for Someone Spiked My Water! Yes, this is a superior camp. It’s cool at night, comfortable for sleeping. I close the windows and sleep under one quilt in a cotton nightgown. During the day it’s in the 70s and 80s… shorts and shirtsleeves weather. I can’t remember if there were curves in the road too tight for your rig. It is a lot of winding around and upward pull. I’m not looking forward to the drive out of here, particularly the first mile. It’s a very long and very steep climb with no place for the PTV to rest. This is the first time I’ve settled into a campground or boondock without being well-prepared. I don’t know if I dare staying through the weekend with my propane supply running low. Love Spike and Bridget the water dogs. My friend recently acquired a six month old pup and guess what..Rose loves to soak in the baby pool!! Must be the weather in Phoenix LOL. 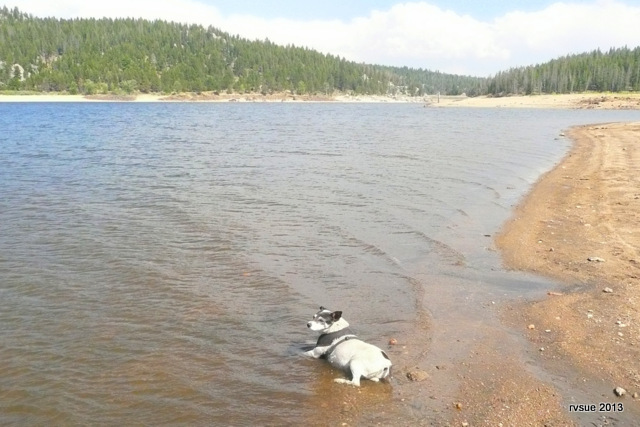 I think my dogs would like to soak…they love baths…I’ve never taken them to the lake. Nice camp and notice the weather in the mid 50’s. I’d schrivel up in that weather. Beautiful country in that area. You have to take that weather widget “with a grain of salt.” Right now, as I type this, it reads 52 degrees. I went outside wearing a pair of shorts and a cotton shirt and it’s comfortable. It says it will get up to 76 today and my experience tells me it will be warmer than that in full sun. This is what I consider perfect weather. 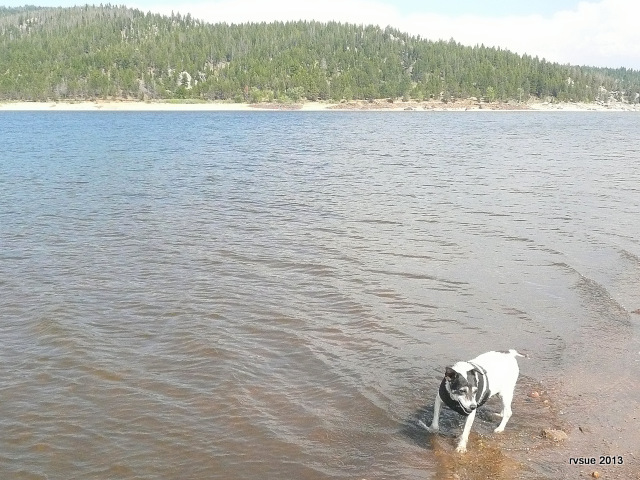 I love to see puppies and dogs play in water! Forgive me for hijacking your blog to send a message to Rattlesnake Joe. I know he was a fan and maybe there are others that will welcome this news. “Art Bell, radio’s master of the paranormal and outward edges of science, will return to the microphone on Sept. 16 with a new nighttime show on Sirius XM Radio. Bell was one of radio’s top syndicated voices in the 1990s before walking away from his nightly show in 2002 due to family issues. He worked occasionally after that but hasn’t been on the air since Halloween 2010. No problem, Ed. Glad to offer my blog for any good news! Ed, I saw that too! I haven’t really listened since Art left the air; now I’ll have to get SiriusXM just to listen. I was surprised to find him back home; last I heard he had moved to the Phillipines. Thanks for the heads up Ed. I welcome him back very much. What is the purpose of the “suits” the kids wear? My Standard Poodle, Lacy, doesn’t like water! It seems impossible that a dog bred to retrieve doesn’t like water! 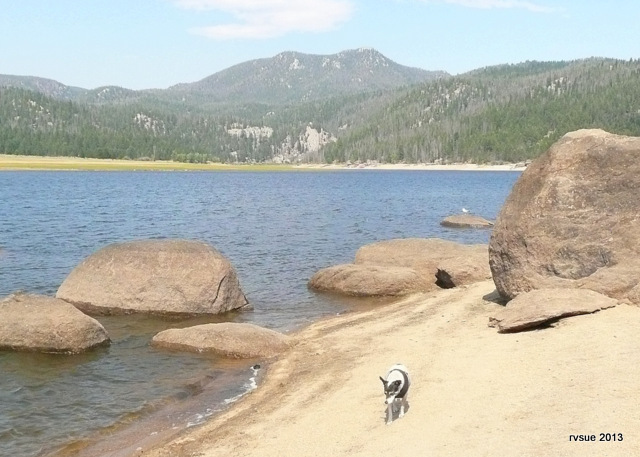 Great photos of a not busy lake this Summer. The suits I referred to are their harnesses. Dogs are supposed to be on leash in the campground (even though I haven’t seen any of the dogs on leashes), so I walk them on-leash until we get away from the campground and day-use area. That’s strange that your Lacy doesn’t like water. Neither did Bridget until she saw Spike soak a couple hundred times. Then she tried it. The three of you nutcakes have a wonderful life! I too like someone Spiked my water…it’s a dog’s life. Besides your fridge…what else is depleting your propane? Nice digs…..have a great day! Yeah, “three nutcakes” is more accurate! Ha! My propane is being depleted by my percolator and my cooking, in addition to the fridge (I’m not using the hot water heater). I also didn’t stock groceries very well. Everything I have to eat requires propane. I’m not going to eat chicken and rice soup cold, for instance, or raw eggs. Can you use the fire pits????? that will cut down stove use. You also had that NEAT fold out charcoal grill…..just sayin’….. The Crew looks comfortable in that beautiful campsite. I thought about that… kind of inconvenient to heat up a bowl of soup. I haven’t checked to see what the campfire situation is right now. But none have it better than the one’s that read RVSue..
You’re welcome. I’m very happy you’re along for the ride. The first two lines of your comment sound like the beginning of a lyric. How was the reunion? I’ll email you soon since you probably won’t see this. Great time at the reunion and the time in UPSTATE New York!!! 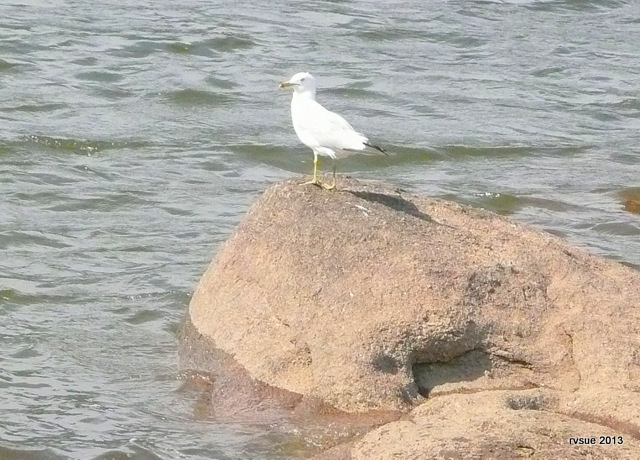 Going to put pictures up on Picasa soon. What a pretty girl Bridget is–that is a great photo of her! This is probably a dumb question, but what is that concrete-looking post with a rope across? Could it be to keep boats from going through the inlet? It looks so clean and fresh there–take a nice deep breath of mountain air for me! I don’t know what that post/rope is all about. There is a dam up at that end. I wonder if the cable or rope is lit at night. I may investigate that. I can’t see that part of the lake from my campsite. Inhaling mountain air for you! This may be the time you remove a propane tank and carry it to town in the PTV to get it filled, and get groceries while you’re at it. That site seems too nice to leave early because you ran out of propane. Hopefully the propane will last till you’re ready to go. Damn! I wish I still had a rig. I’d head up that way in a heartbeat. I’ve been many places in the western US but I never made it up there. I was in South Dakota for years and still had a rig but didn’t venture there. Gawd! I envy you Sue not just for your travels but also for your choice of companions. Hi Bri and Spike…Glad you got your water fun. I feel your pain! I used to envy people camping in beautiful spots…. and now I’m here. Dreams do come true. Sue! Love your blog! Love it so much I went back to the beginning and read many of your earlier posts. Plus, I’m the purchaser of the messenger bag listed at the bottom of your post. Just had to support your travels. Hub and I bought a small Class C in 2010, retired on Friday, July 29, 2011, and took off in our rig Tuesday, August 2, 2011. Made some newbie mistakes (nothing serious) and have learned/seen so much. We’ve been spending time with family back in Ohio and will take off tomorrow for another adventure. Best wishes to you! Happy travels. Enjoy the clean air, here in Southern Oregon there are so many fires you can hardly see the surrounding mountains. I have heard southerners talk of humidty so bad you can cut it with a knife…well this air is so full of ash I can say the same thing ha. Say after studying your beautiful camp site it occured to me you probably don’t have any sticker weeds like foxtails. That’s the great thing about getting up high. I’ve spent a good part of my life pulling foxtails out of my socks ha. I wonder if you got some water wings for your critters they might like the idea of swimming? Ash? That’s awful. And probably smoke, too. Sorry you have to put up with that. I’m not sure what foxtails are, guess they’re some kind of burr or goats head. Nothing like that around here. And hardly any bugs or flies. I’ve taken Bridget and Spike out in water where they can’t touch the bottom (not here, in the past) and they had their PDFs on. Spike loves it. I push him around like a little sailboat and he literally drifts off to sleep. Bridget likes it, I think, although she’s happy to get back on terra firma. Fox tail is grass/weed and bushes out with spiny needle like seeds…really bad for dogs if they get the spiny needles anywhere near their mouth or ears. Once in ear or mouth it’s almost impossible for dog to rid of needle. My German Sheppard dog, Heika, had to have ear surgery cuz a needle worked it’s way down the ear canal. Your nice images make me want to grab a new camera; my last photo of the Mojave Green hardly shows the green color, and he’s green as green can be. Ya’ gotta’ be careful around desert women these days… We tend to be crazy AND packin’ heat! LOL 🙂 You’re probably right, I was probably in more danger than she was. Times have changed for sure, I used to love the peace out here and never having to think about a weapon; all it took to change this was my first encounter with a lunatic. I hope to never have to use any of them. I’ll be packing it in tomorrow and heading for another adventure, I think I’ll go over to the old mines in Mojave, Ca. The last time I was there I was a teenager under the influence of Jack Daniels and didn’t get to enjoy the scenery. Take it easy Sue and enjoy the nice weather. Okay, Bob. Be careful at the mines and enjoy yourself. Some times they send females to scout the area before the bad guys strike. This happens with home invasion in Phoenix, a female knocks on door to use phone or asks for water. I never open the door but have a sliding window next to door that I slide open to talk to whomever. Spike is getting used to soaking every day. It’s an easy pose for me to photograph. Glad you like his pics! I did some snoopin and saw that the campsites are $8 per night and a 16 day limit.Is this correct? That’s correct, Stan. And if you have a geezer pass, it’s only $4 a night. You can see the fee or lack of one by checking Where We Are Now in the sidebar. I can’t get enough pics of those two nutcakes livin’ the dream. That’s a good thing, Marcia, ’cause I can’t stop posting pics of them!